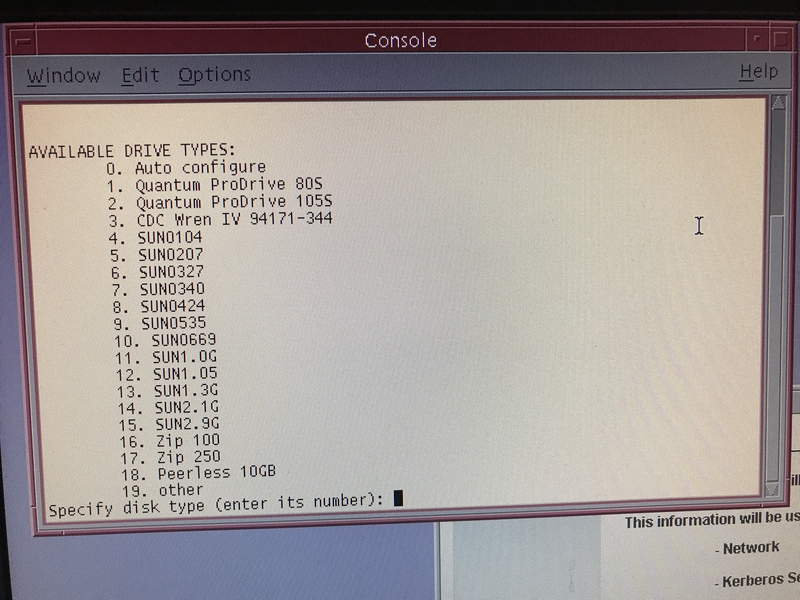 Yeah, Solaris 9 is how I got my FC-AL drives formatted; I can't remember if I had to provide geometry information or not, but I think it just formatted straightaway. However, I may just be misremembering that due to how much simpler it seemed than trying to coax 10 into the job, because apparently Larry Ellison's anti-Midas touch finally got around to the disk utilities in that version or something. If you tried 9 and can get to the graphical install environment, you should at least be able to launch a separate terminal window from which you can format the disk. Just right-click(?) on the desktop area and it should give you a menu with that option. So, to give a bit more context, I took pictures! This first one illustrates the format options as provided on my Solaris 9 install disk. For the record, this is version 9/05, on DVD. As you can see in the first image, auto configure fails; this is true for both versions, and the exact same error occurs in both. Now, strangely enough, the error mode of the failure to format given the "usual" SUN72G format has changed as of tonight: Instead of trying and failing at every chance, now it's not even really trying. The picture below illustrates this error, which, again, is consistent across both Solaris 9 and 10. I'm pretty well stumped. 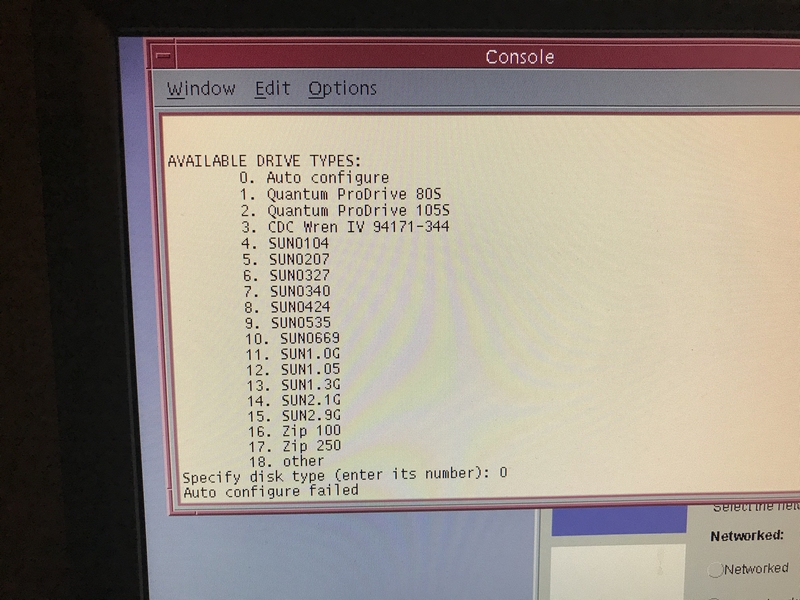 Do I just have a dud drive? Are there any interesting messages in dmesg or /var/adm/messages? 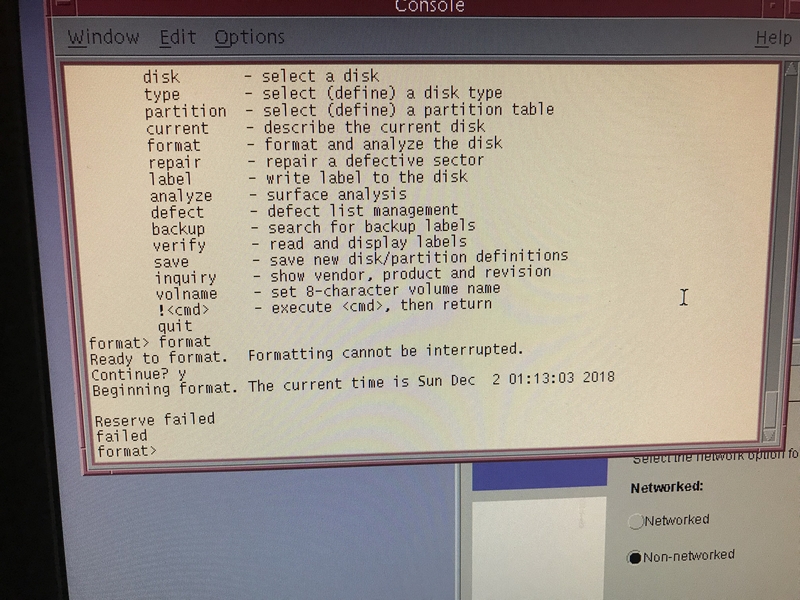 After booting into single user mode from CD/DVD (w/o X11, installation aborted), try to find a backup label first by using format utility, then "backup" and continue as stated in the docs by using "backup"
BTW: what are the outputs of my questioned commands under "format" in the former message?